Police in Baltimore County are seeking the public’s assistance in identifying a burglar in the Rosedale area. On Wednesday, June 14, between the hours of 9 a.m. to 11 a.m., the suspect attempted to gain access to at least 11 homes in the areas of Van Dyke Road, Whitby Road, Utrecht Road, and Cynthia Terrace by trying door handles. The suspect was able to gain access to one home on Cynthia Terrace through an unlocked door but doesn’t appear to have taken anything. He broke a window to gain access to a home on Van Dyke Road but was scared off by an alarm, then stole a bicycle from another yard on Van Dyke Road but later abandon it in a yard on Utrecht Road. He was last seen fleeing responding police on Whitby Road. The suspect is believed to be from that area. 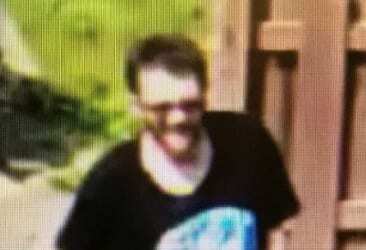 He is described as a white male, approximately 6’0”, 170 pounds, with dark shaggy hair and a beard. He was wearing a black t-shirt with some sort of decal on the front and blue cargo shorts. At one point he was also seen wearing a baseball cap. A local surveillance camera was able to capture an image of the suspect. Anyone with information on the identity of this suspect is asked to call police at 410-307-2020.